Note: Date has been changed due to predicted bad weather. Our annual Clean-Up Green-Up is Saturday, May 2nd April 25th, 9am - 2pm, and we have a lot of great things planned for the community. Get ready to get outside and beautify your yard. Learn the ins and outs of living green in Chicago! This FREE event is open to the public and all are welcome... so bring a friend! The day will be chock full of exhibits and demonstrations which include installing rain barrels, using essential oils for better health, vermicomposting, free bike tune-ups, planting with EarthBoxes, fun kids’ activities, homemade Kombucha demonstrations, Eco-Andersonville, and much more. Come out to meet your neighbors and discover how you can help nurture the environment. 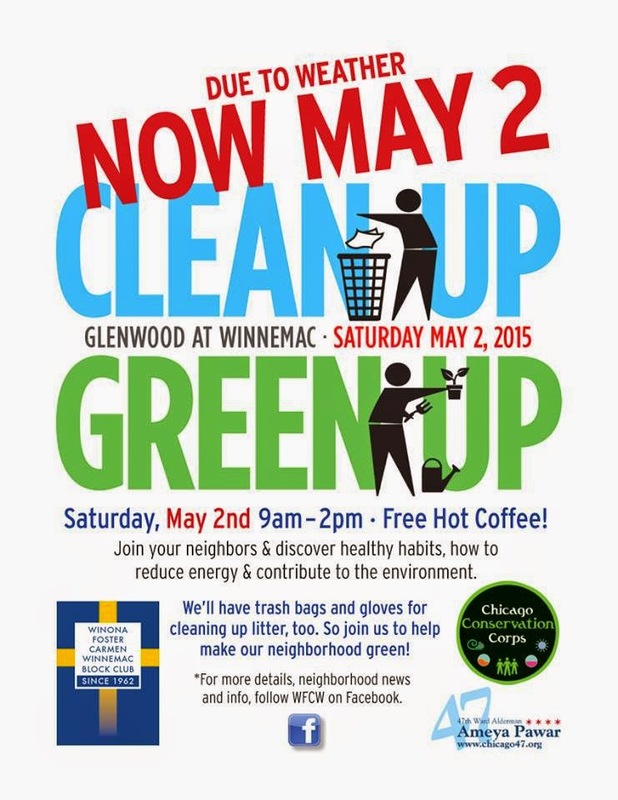 WFCW is dedicated to greening the neighborhood. Come learn how you can help! There will be trash bags and gloves for cleaning up the litter, too. So, join us to help make our neighborhood shine! Bring a coffee mug! Coffee is being donated by our local business neighbors at La Colombe!